My issue all started because of junk email. Due to my father's addiction to Publisher's Clearinghouse sweepstakes and other types of "instant millionaire" scams, my siblings and I have had to intercept his mail. The snail mail goes directly to my sister, "Gretchen", who handles his bill payments and other financial issues; the email goes directly to my account, so I may monitor him while he is online. I have a very high security SPAM filter, so absolutely nothing gets through that should not. Needless to say my father is not happy with this arrangement, but it is in his best interest. I have discovered that my father has opened a second, secret email account with an address very similar to mine; so when he logs on it appears he is on my account, unless I look very closely at the address. I am not certain how long he has had this account, but it appears to have been long enough to cause some serious damage to his finances. Last week, when Gretchen was reviewing his bank accounts, she noticed one of them had been drained of all money by a West African bank. Dad freely admits that he cashed a check for several thousand dollars as part of a plan "to help an African prince escape his war torn country"; and needless to say (again) the whole plot was a scam - the international check bounced and my father is on the hook for the full amount since he "forwarded the money to the prince" after taking the 10% cut promised to him. Gretchen and I tried talking to the customer service department at the local branch of our father's bank, but there is nothing they can do to get - or give - my father’s money back to him. My sister and I are understandably furious over the situation. However, Gretchen is angry at me, saying that the whole situation is my fault and that I should have been keeping a closer eye on Dad's e-mail. Tazi, she is the one who handles Dad's finances, and she was the one who left his name on the accounts so that he could withdraw money at any time! Gretchen is talking about suing me on behalf of our father (she has financial power of attorney) to get back the money he lost. The amount I would have to pay if I lost would be substantial, and my husband and I would have to drain our retirement savings to do so. We have generously offered to a three-way split of the cost of the loss with Gretchen and my father, but she will not hear of it. She wants "full compensation" for what she sees as my carelessness and what I see as my father's underhanded deception and stupidity. What should we do, Tazi? The rest of my siblings are giving the situation a wide berth. As for the issue with your father, the first thing you want to do is report the case to your local Post Office Inspector General. Your father may have been the victim of mail fraud. If the money he received - or sent - was wired or mailed through the U.S. Postal Service, it falls under the jurisdiction of the U.S.P.S. Inspector General's Office. If it was sent/received through Western Union or other privately owned money-wiring service; it is a matter for the FBI. The crime can be reported through the Internet Crime Reporting Center. Although there is no guarantee that your father will get his money back, reporting the crime to the proper authorities is a step in the right direction. As for financially compensating your father, I think your plan is both generous and fair to all involved. Yes, your sister is correct that it was your place to monitor your father's Internet activity. Even in spite of his falsified email address, had you been monitoring your Dad while he was online this issue probably would not have occurred. However, you are correct in pointing out your sister's failure to remove your father's name (at least as a signatory) from his bank accounts, thus allowing him to follow through with his get-rich-quick scheme. By putting yourselves in a position of power over your father, you must also accept the responsibility that comes with it. This does not mean that your father is off the hook, though. He has a helping of responsibility to accept in this matter, too. 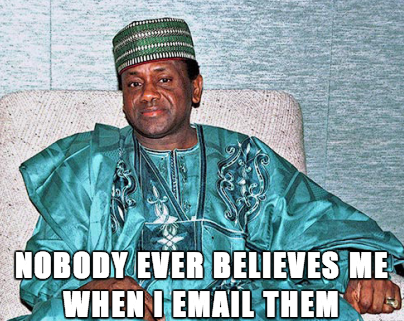 Had it not been for his duplicitous behavior, he would not have received the initial email that started this entire problem. Your husband is quite generous in his acceptance of this plan, and it tells me he takes his wedding vows (especially the "for richer or for poorer part) very seriously! My compliments to the man on this matter! Right now, you need to give Gretchen some time to cool down from the shock of this situation. Should she continue with her threats to sue you, all I can advise is to contract with a good lawyer to represent you. In the meantime, I suggest you check out the website LooksTooGoodToBeTrue.com. The site offers a good hard look at the Internet and email scams that are out there. Sincerest thanks to the FBI's Providence, RI office for the information provided in answering today's column! -- T. K.
An Unlocked Door Is A Burglar's Dream Come True! A New Cat Or A New Boyfriend? Tough Decision! Man Likes To Wear Makeup. So What's The Issue? Is It Ever Too Late To Pick Up A Special Order?